Some players go into major tournaments believing they are fated to play well, others settle for just expecting to play at all. For some however, there are tournaments where you’re selected as a squad player. The players in front of you seem well set in your position and there’s an inevitable dawning rationale that in all likelihood, you’re just there to make up the numbers. Most of the time, that’s just how it plays out. No-one remembers the players who never got on the pitch, and that seems to be your fate. Just occasionally though, the fates take a hand and the stand-in steps onto the stage to steal the show. 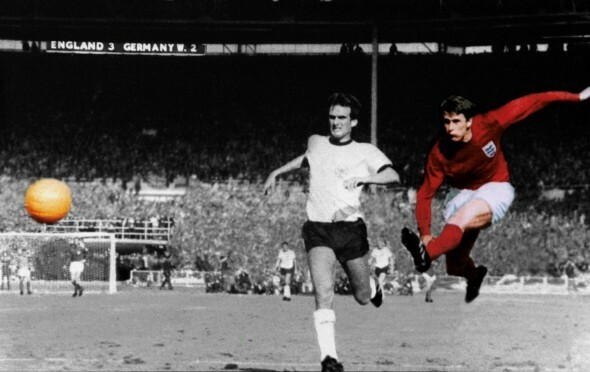 In the 1966 World Cup, Geoff Hurst enjoyed such an experience. The 24-year-old striker had, ironically made his England debut against West Germany in February of the same year. That, and another couple of performances on the international stage, plus his play in domestic games for West Ham United had persuaded England manager Sir Alf Ramsey to include him in the squad of 22. When the tournament got underway however, no-one doubted that Ramsey’s first-choice pair to spearhead his team’s challenge for the Jules Rimet Trophy was Jimmy Greaves and Roger Hunt. There were no substitutes in those days, so Hurst was compelled to sit and watch England progress, at first unsteadily, and then growing in confidence, as they moved through the group phase. A goalless draw against Uruguay was followed by victories over Mexico and France. It was in the latter game though that fate took a deciding hand and plucked the young Tameside-born striker from relative obscurity and anointed him as England’s most celebrated hat-trick hero. Greaves suffered a gashed leg against France, ruling him out of the quarter-final clash with Argentina, and with his star striker no longer available, Ramsey turned to Hurst. It was a decision that would reap huge dividends. Against the South Americans, he nodded home a near-post header to send England into the semi-finals and a last four confrontation with Portugal. England would again be denied the services of Greaves, so Hurst retained his position in a 2-1 victory where he set up the second of Bobby Charlton’s goals. All was then set for England to face West Germany in the World Cup Final on 30 July 1966. By now, Greaves had been declared fit to play and, for such an important game, there was much clamour in the press for him to be reinstated, despite Hurst’s relative success as the stand-in for the great man. Alf Ramsey was nothing if not loyal to his players however, and certainly not a man to be swayed by popular opinion. Hurst got the nod ahead of Greaves, and history beckoned. ‘England expected’ to paraphrase what Nelson once ‘flagged up’ and a bright sunny day seemed to set the perfect scene for a home triumph as their manager had predicted when given the job, but things didn’t start well. A less than regulation headed clearance handed the opening goal to Helmut Haller and England were behind for the first time in the tournament. Just a dozen minutes had been played, and England were looking for a hero. Six minutes later Hurst began to write the sort of Boy’s Own story of footballing glory that surely should have remained the exclusive purview of such comic books. A quickly taken free-kick from club mate Bobby Moore found Hurst running into space and he brought England level with a deft header. Any England fans now hoping for their team to assume control were to be disappointed though. The game progressed either side of the break, without either side able to dominate although England pressed and Hurst led the line with vigour. A stalemate at the end of the 90 minutes seemed increasingly likely as time drifted away. That would indeed be the case, but there was drama aplenty to come before that. Mirroring the gap before the first goal, England went ahead with 12 minutes remaining when Martin Peters swept home after a Hurst shot was blocked. The cup was dashed from English lips though when Wolfgang Weber brought the game level again seconds from the end. It would take another 30 minutes – and a couple of interventions from Geoff Hurst to decide the matter. Eleven minutes into the first period, a cross from the right found Hurst in the West Germany area with his back to goal. Pivoting he fired high past Hans Tilkowski. The ball struck the bar, bounced down and away. Following in, Roger Hunt immediately turned to celebrate the goal, but had it crossed the line? The so-called ‘Russian linesman’ – who was in fact Azeri – not having a common language with the Swiss referee nodded a few times when consulted. Who knows what was said in those moments, but the goal was given. Please feel free to debate the validity of the award, but with tired German legs pressing for another late equaliser, the game would soon be put beyond doubt. Another desperate German attack broke down and Bobby Moore fired a long ball upfield. The German defence had by now been almost completed denuded by the need for goal and as the ball dropped to Hurst, he cantered into acres of green Wembley turf with just a single defender standing between him, an advancing Alan Ball to his right and the German goal. Ball screamed for a pass as the defender tried to close down on Hurst. Such plaintive appeals, if heard, were understandably ignored however. Hurst advanced as glory opened its gates for him. Reaching the area, he smashed the ball past Tilkowski. He would later confess that he struck the ball as hard as he could so that if he missed the target, it would eat up the remaining seconds of time as the ball was retrieved to restart the game. There was no need for such things though. The ball was in the back of the net. England were champions of the world. Ramsey had promised it and had delivered. It was an outcome that many had both hoped for and expected. For one particular player however, fate had delivered the unexpected in in the most glorious of terms. The stand-in had taken centre stage, and won the World Cup for his country. (This article was originally produced for the ‘Virtuoso’ series on These Football Times website).